For cereal layer: In a food processor, crush Chocolate Cheerios™ cereal and Honey Nut Cheerios™. Transfer to a bowl, add butter and mix until everything is combined. Grease a rectangular baking dish that’s approximately 12 inches long and line with parchment paper. Pour cereal and butter mixture into the baking dish. Use your hands or the bottom of a glass to press down the cereal along the bottom of the baking dish. For the filling: In a blender, combine pumpkin puree, evaporated milk, eggs, sugar and pumpkin spices. Add the mixture over the layer of cereal and bake for 40-45 minutes or until firm in the center. Let cool completely. Cut into bars and serve with whipped cream and Chocolate Cheerios™ cereal. Make them a day ahead and refrigerate over night. This will make them easier to cut. Fresh pumpkin puree is best but if you don’t have any available, use a 15-oz can. Fall is here and with the beautiful leaves comes pumpkin season. 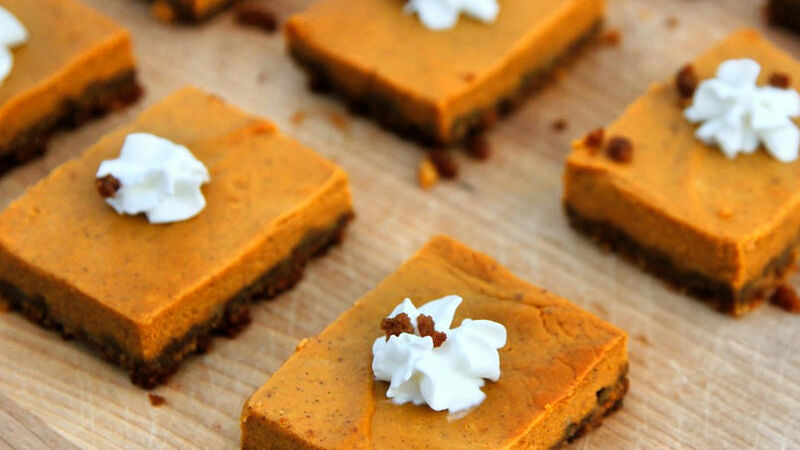 I love to use pumpkin in so many recipes, especially sweet ones. The best part of all is that my kids really enjoy it. This time I bring you a variation of the traditional pumpkin pie. Its creamy, yet firm consistency makes it ideal to make individual bars. These little bars have a layer that’s made with a combination of Honey Nut Cheerios™, butter and Chocolate Cheerios™. Because who doesn’t love chocolate?